I could imagine this scene in those 2 episodes where Superman is flying those little girls in the sky. "Superman, its freezing, I'm getting hypothermia!" "Superman, help, I can't breathe. The atmosphere is too thin." POW, that brings up a lot of discussion about what really are SUPERMAN's powers. Some have theorized that his powers are psychic and supplied by exposure to photons in the yellow wavelength. These psychic powers extend an aura around him which protects anything or anyone in his imediate proximity. These also give him strength and invulnerability to the extent of his "charge" from the solar exposure. If that is so, it would protect anyone or anything he was in close contact to. Like little girls or Lois Lanes etc.. Damn, this is just too easy. The picture above is . . . a Robox. Fun Facts } The Case of the Talkative Dummy, October 03, 1952. The theater set was the same one used by Charlie Chaplin for his classic movie ''Limelight." 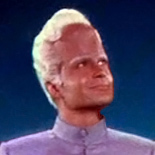 Guest star Pierre Watkin played Perry White in the Superman serial. Phillip Pine would later play the infamous Colonel Green on Star Trek (TOS) episode The Savage Curtain. The red outfit that Pine wore on that ST episode would be recycled for Robin Williams spacesuit on Mork & Mindy. Episode # 23 from season one } ''Ghost Wolf,'' (February 20,1953). 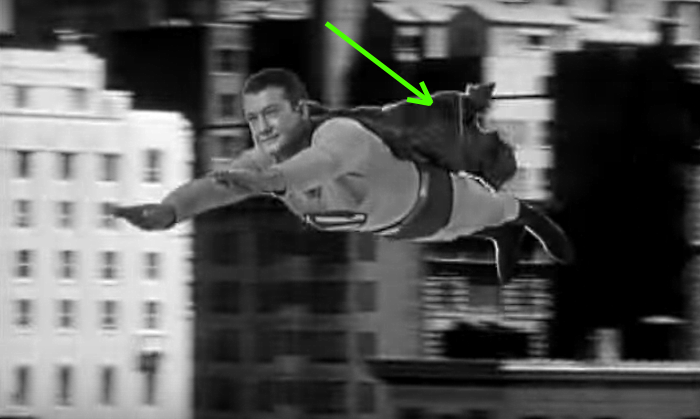 This would be the final time that George Reeves would allow himself, as Superman, to be flown through the air via wires after crashing to the stage floor. "That's enough of that. Peter pan can fly with wires, but not Superman. ''...George Reeves after the stunt mishap. George was smart. The wire-supported flying scenes didn't work well anyway, and they certainly weren't worth the risk he took in doing the stunts. 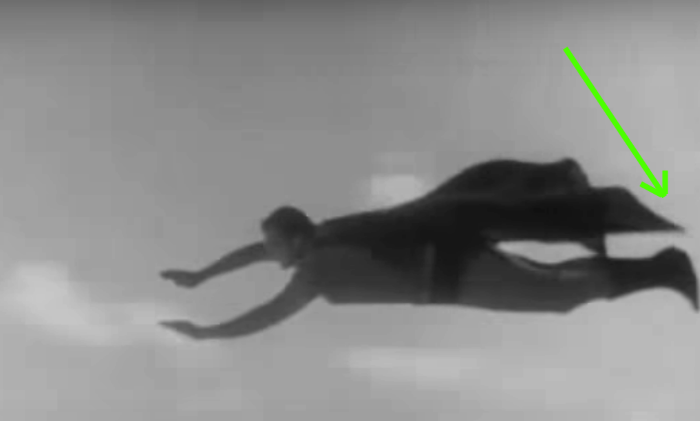 Ironically, some of the best early era flying scenes were done in the serials with dummies on long wires stretch taunt like zip lines, with the dummies zooming across landscapes and sets in a very convincing manner. I cannot agree with you more, Bud, in regards to how well done flying scenes were done in some of those classic movie serials. 1941's ''Adventures of Captain Marvel''still remains awesome looking to this day for the flying segments with CM. The special effect was created by the legendary FX maestros Howard & Theodore Lydecker. A 7'-foot dummy was used that was made of paper mache 7 weighed 15-lbs. An elaborate pulley system was devised in order to film the CM dummy soaring through the air. 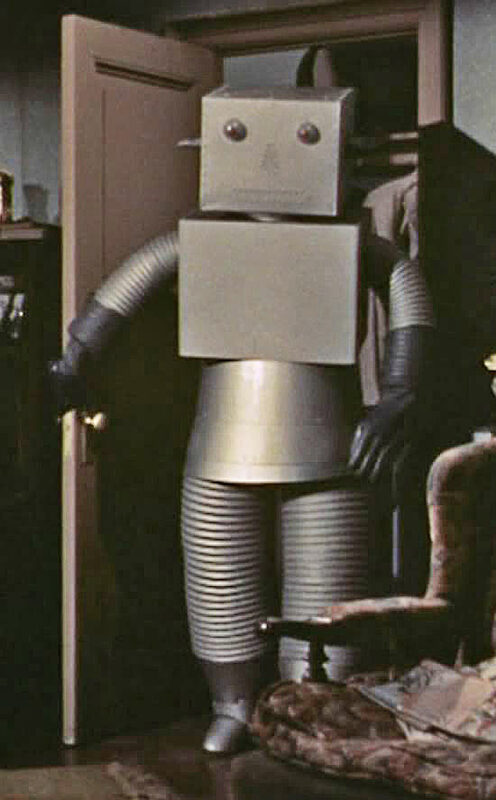 It was originally created for use in the Superman movie serials but discarded. A prototype was made. A pity that the AOS TV series could not have taken advantage of the pulley system that was intended first for the movie Superman flying scenes. I'm sure that the TV show had neither the budget or shooting schedule time to do so. By gum, it occurred to me this morning that the dummy-on-a-wire system might not have work as well for Superman as it did for Commando Cody and Captain Marvel, the two I remember who used that system. Superman's cape might not have looked as well as it did when George laid on the board and faced a big fan. Commando Cody had no cape, of course, and Captain Marvel wore a short cape that hung over one shoulder. Frankly it fluttered around too much in the closeups of Captain Marvel when he was position prone, probably because the cape seemed to be made of lightweight silk. But George's long cape, made of heavier material, might have laid across the back of the dummy if the wind weren't blowing hard enough from the speed of the dummy on the wire. 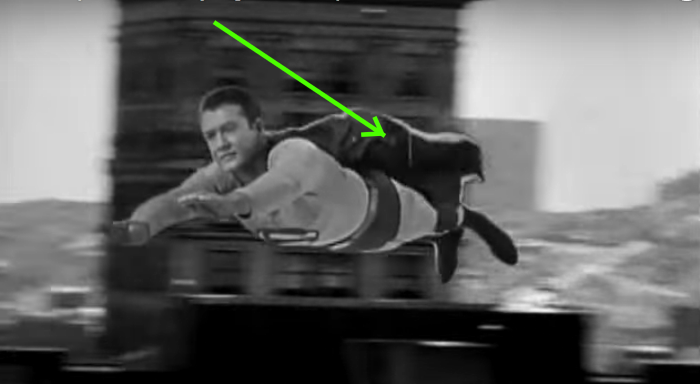 However, I found the YouTube video below with 13 minutes of Superman flying scenes, and it showed me a few things that surprised me. I'd forgotten just how many ways they actually presented the flying scenes. The video includes the well known scenes of George laying on a platform, as well as scenes hanging from wires in front of a rear projection screen, and the shots of George superimposed over a moving cloud background. 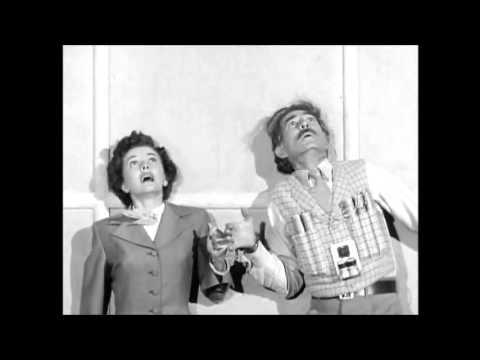 AOS episode #2,''The Haunted Lighthouse,''September 26, 1952. 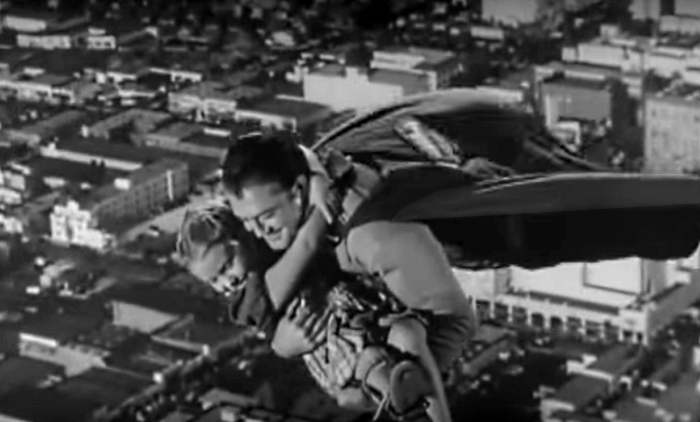 A number of episodes from the TV series were adapted from both the radio show for Superman,as well as some of the comic books. I remember being surprised by how little of Superman we get to see in this very early episode. It was, in fact, a lot of Jimmy Olson and just a little more of Clark — with Superman saving the day at the end, naturally. Is this the one in which the gangster and his girlfriend are stranded by Superman on a snow capped mountain at the end so they won't reveal his secret identity? If so, the fact that things didn't end well for the two villains was basically Superman's fault! A moral dilemma that didn't seem to bother Kal-Ell. The polar opposite of "The Haunted Lighthouse", this one is Superman at his best — despite the lack of FX we wanted to see of Superman ramming an asteroid to prevent it from colliding with the Earth! 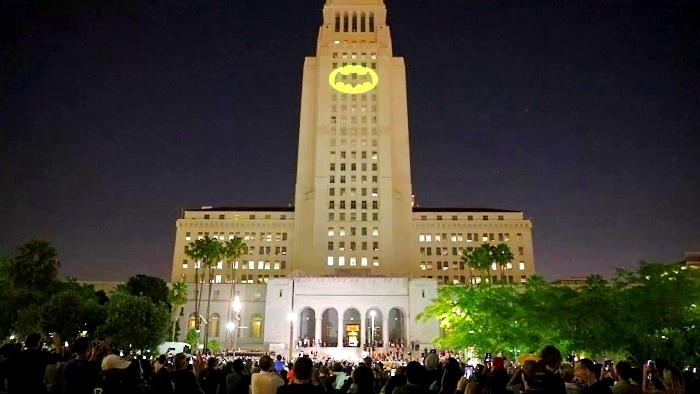 Interesting that L.A. shone the image of the Bat Signal upon the town hall building honoring the passing of Adam West, that also served as the Daily Planet on the AOS. My God, this is spectacular! And look at the crowd. Amazing! 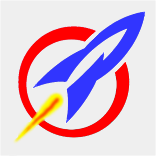 I was on the verge of suggesting that the logo wasn't projected, it was a hanging banner, because I couldn't figure out how the logo could have been projected such a great distance. But the picture below proves that it was. 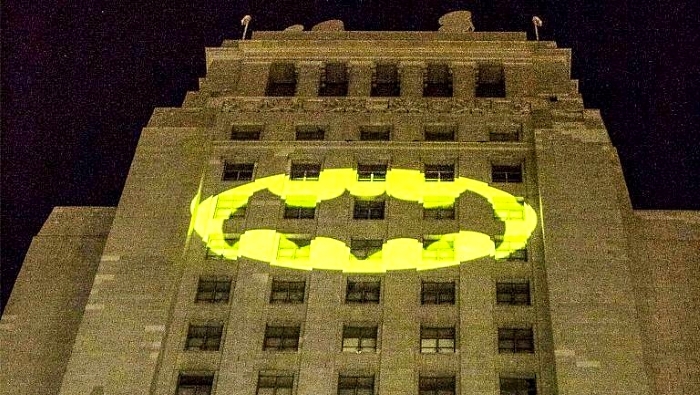 This was a wonderful tribute, and I salute the folks who organized it.